The Girl in the Blue Coat is a story of bravery, the power of unromantic love, and ultimately, how we choose to cope with the consequences of our decisions and what those choices say about our true intentions. 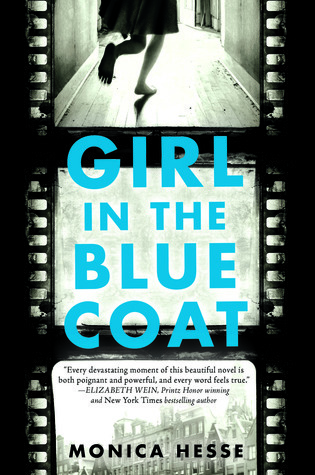 - The Girl in the Blue Coat achieves the thing I always chase in fiction and the very reason I believe it is so crucial: - it takes characters and situations we think we already know and adds complexities to them that challenges our worldview. This comes across in waves in Hesse's characters making this an ideal book to encourage young adult readers to think about people more complexly. - The setting made me see Amsterdam in a different light and the Dutch culture shone through the writing. It came as a surprise that Hesse isn't Dutch herself which shows how authentic the book feels. Of course, this is from the perspective of an English reader, I would be interested to see how Dutch readers felt about this. - It's impossible to express why I love the characters so much without unveiling major spoilers but my goodness, you have to meet them in the pages for yourselves. - I'm not entirely sure who this book is for. The writing style is simplistic but occasionally quite mature vocabulary and old-fashioned terms throw the prose in a different direction. I think that's a nod to the historical aspect of the book but it makes the characters' voices feel far older than they are meant to be which cracks the authenticity somewhat. In the author's note, Hesse mentions that the characters were originally adults and that shows through in their voices albeit, not necessarily in their actions and thoughts. It still works but a little tweaking would go a long way in improving the realism here. - The ending felt rushed, especially when you compare it to the relatively slow build-up in the beginning. This was the only major letdown for me as the twist was the backbone of the whole story but the page-time given to it just didn't do it the justice it so badly needed. All in all, I loved this book but I can see why it might not necessarily capture the hearts of many younger readers. It's a slow, delicate story for the most part and it doesn't shout loudly about its life/death intensity the way many other YA books on the Holocaust do. In that respect, it can be well compared the Markus Zusak's The Book Thief - it's a novel to fall in love with but not one to recommend to a reader who wants a fast-paced, action-filled read. "Here is the thing about my grief: it’s like a very messy room in a house where the electricity has gone out. My grief over Bas is the darkness. It’s the thing that’s most immediately wrong in the house. It’s the thing that’s most immediately wrong in the house. It’s the thing that you notice straight off. It covers everything else up. But if you could turn the lights back on, you would see that there are lots of other things still wrong in the room. The dishes are dirty. There is mould in the sink. The rug is askew. Elsbeth is my askew rug. Elsbeth is my messy room. Elsbeth is the grief I would allow myself to feel, if my emotions weren’t so covered in darkness." Though this book looks like misleadingly easy read from the prose style, it is perhaps best saved for those who get enjoyment from tackling philosophical issues through a more subtle and intricate lens rather than very young YA readers. The Girl in the Blue Coat is a truly memorable read that succeeds in adding relatability and complexity to otherwise distant real historical actors who lived in Nazi-occupied territories. Sign into Goodreads to see if any of your friends have read Girl in the Blue Coat.